The 2015 New York Jets have been a team that, when healthy, looked capable of fighting for an AFC wildcard spot. Meanwhile, the 2014 Jets were a team that couldn’t win. The new-look Jets have been impressive with Ryan Fitzpatrick under center, Chris Ivory healthy and Brandon Marshall looking dominant. Compare that to the team last year; Geno Smith was benched for half of the season, Chris Ivory ran against 7 man fronts, and Eric Decker battled injuries and double coverage. The tale of two seasons writes itself; at the halfway point, the new Jets have as many wins as the team did all of last year. Then Sunday happened. The Jets lost Ryan Fitzpatrick because he doesn’t know how to slide. He is listed as week to week, but that doesn’t change the fact that the new-look Jets have reverted back to the old Jets faster than you can say “week-to-week with ligament damage.” (Admittedly that does take a while to say.) Geno Smith doesn’t have what it takes to start as a quarterback for the Jets. They need too much out of the quarterback position. The defense is top 10 in almost every major defensive category (with the exception of points per game,) but that will not hold up if the offense doesn’t stay on the field and control the clock. Geno has shown that he can’t do that. Chris Ivory has been great this year, and Stevan Ridley should be returning from injury to add even more punch to the backfield, but defenses facing Geno Smith will load the box against the run and dare Geno to beat them in the air, which, as previously stated, he can’t. The Jets offense, which has been lauded in this column, is poised return to last season’s drudging form; two short bruising runs, one badly botched pass play, and a punt. The season isn’t over yet. Fitzpatrick may still play, his status at this point is up to his pain tolerance. He will need surgery, but again, that is up to how much pain he is willing to put himself through. In any case it will affect his ability to hand the ball off and take snaps from under center which will hurt the run game. This identity on the ground is pivotal to Gang Green’s success and if that is negatively effected, the offense as a whole begins to crumble. That being said, the 2015 Jets are much more dependent on the pass. The rushing game is responsible for only 33% of Jets’ first downs in 2015, down from 42% in 2014. Rushing TD’s also account for only 31% of Jets’ TD’s in 2015 down from 40% in 2014. If you take out Ryan Fitzpatrick’s rushing TD that number goes down to 26%. In a way this is a good thing. The Jets are on pace to score more overall TD’s in 2015 (43 as opposed to 27) and more rushing TD’s (13 as opposed to 11) as well. 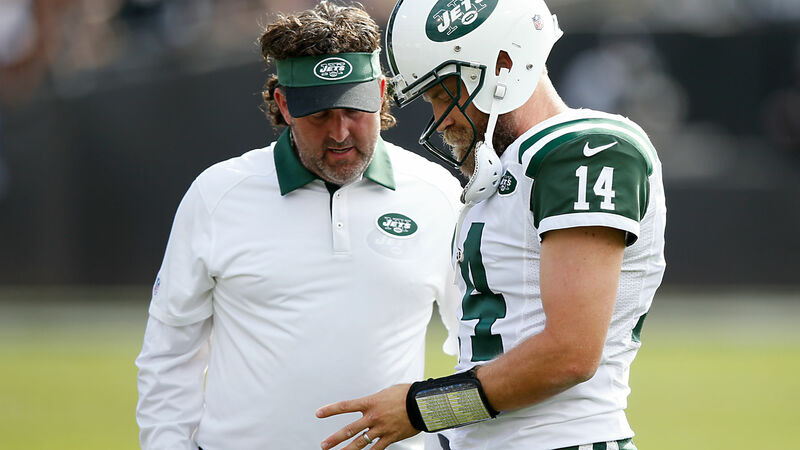 Losing Fitzpatrick threatens the whole offense. The 2014 Jets were 28th in points per game and 22nd in yard per game. The only new piece of the offense without Fitzpatrick is Brandon Marshall, who depends on the quarterback to make a difference. Fitzpatrick is averaging a half a yard per attempt more in the passing game, with more attempts per game and he is taking less sacks, resulting in a better net yards per game as well. Numbers can also be deceiving. Geno Smith had a Quarterback Rating of 87.9 after replacing Fitzpatrick on Sunday. For the season Fitzpatrick has an 86.5 QBR. He also threw for 265 yards compared to Fitzpatrick’s season average of 217. But Geno has also been sacked 3 times for a loss of 19 yards, in one game, while Fitzpatrick has been sacked 4 times for 20 yards in 6 games. Geno let himself get sacked twice in the last 5 minutes, effectively killing any momentum for the Jets. ESPN’s Total QBR also tells a different tale, Geno has a 66.2 compared to Fitzpatrick’s 78.44. The ESPN score gives different weight to different passes, for a full explanation go here (link: http://espn.go.com/nfl/story/_/id/6833215/explaining-statistics-total-quarterback-rating), and by attributing more importance to clutch plays, Geno’s score plummets in comparison. The Jets are at the midpoint of the season, entering Week 9 with no sure starter under center. The future for Gang Green comes down to a tale of two seasons, last year’s failure, or this year’s promise. Tom is an avid sports fan and life-long New Yorker. He likes long walks on the beach and extra innings. Also he doesn't mind the DH. He'll occasionally post on soccer or as he calls it, soccer.